Hi! Believe it or not, we are now down to the last summer rollout of 2017. Where is the time going? Since July marks the first “pre-fall” rollout (which always has a few warm weather items) this is the last “official” summer rollout! At first glance, I was a bit overwhelmed at all of the ruffles and off-the-shoulder that we’re still seeing everywhere, but in typical J.Crew fashion, once I dig around a bit, I always find items to love. First up, the Ruffle Top in Chambray. I sized down to a 4 in this top. The ruffles on this seemed a bit overwhelming to me, so I could see if you’re petite it might be a bit much. But I have since seen it on several other people online and really liked it. It’s a bit much for me and would be a weekend top since I don’t think it would go well with a blazer (although I admittedly didn’t try it). I like the darker color of the chambray though and it is a longer length. If it’s your style, with white jeans and neutral sandals this is a solid summer outfit. It’s lightweight but not flimsy. The weather is FINALLY starting to act like summer and there is no better time than now to get everything you need for those summer parties and vacations! Whether it be shorts, party dresses or accessories, J.Crew has you covered. The store will be offering a special discount of 25% off your purchase (any better existing discounts in store will apply). AND if you’re a student or a teacher – bring your ID and you can receive an extra 15% off. The J.Crew at the Walden Galleria Mall features Men’s, Women’s and Crewcuts so you can peruse for yourself or the kids. 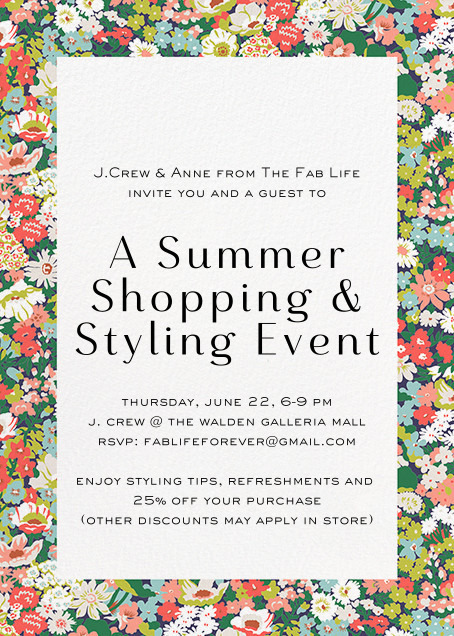 You can check out the Facebook event page or email fablifeforever@gmail.com to RSVP. I hope to see you there!! Hello! Somehow another month has gone by and we are past the Memorial Day holiday and “officially” at the start of summer. We had a chilly first part of the month here but spring pushed through and we were able to enjoy our fair share of sunshine as well. May also kicked off the season of birthday parties, various family milestones, and friends visiting from out of town. In addition to posting my monthly outfit favorites, I am also going to outline my summer wardrobe “challenge”. But let’s get to the favorites for May first. I’m including some work outfits as well as some weekend outfits this around. This first outfit I wore for my nephew’s First Communion Mass and party. It ended up being pretty chilly that day so I added a white blazer and later a denim jacket at the party (didn’t want to risk spills on the blazer) to combat the cold. My toes stayed bare though in the sandals. I am a complete jumpsuit convert and this silk jumpsuit is such an easy throw on and go piece. 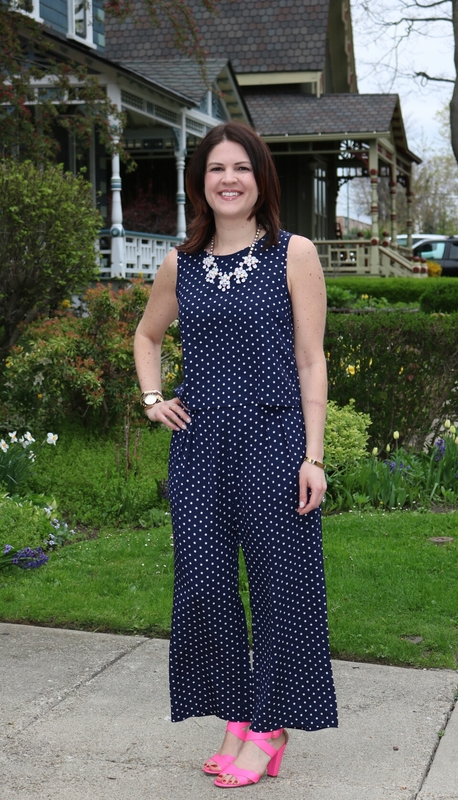 The jumpsuit is unfortunately sold out and the sandals I found on Poshmark recently (they’re J.Crew from a few years ago) but I did link some similar pieces to get the same type of look. Hi there. So, I’ve been trying to write this blog post for weeks. I probably won’t capture everything I want to say in one post but in an effort to put myself out there a little more, keep up with my writing (which I’ve been neglecting) and staying up with the blog, I’m going to attempt to memorialize some of the thoughts I’ve been having about the changes I’ve experienced during the first five months of 2017. This is my story. I am not a fitness or diet expert so anything I am sharing is my own opinion and happens to be what worked for me. This is a bit of a brain dump for me so bear with me. When I get going about something, it’s tough to shut me off. After months of seriously thinking about wanting to do something more about my weight and overall health, I made the decision to commit to a healthy eating plan and regular workout regimen which has led to me being down three sizes and nearly thirty pounds in five months. I have never in my life committed to a diet. I like food too much. I’d casually attempt to count calories here and there and would workout consistently for months without changing anything in my diet, convinced that as long as I was working out, I could eat whatever I wanted. I think there were several years where we didn’t even own a scale. Going to the doctor’s every year was a crap shoot and nine times out of ten I’d get the gentle lecture about staying active and watching my weight, only to be neglected until the next year when I’d get on the scale. I ignored it when clothes didn’t fit and used it as an excuse to build a wardrobe envied by friends and coworkers, telling myself I was showing people that you don’t have to be a size 0 to look good. And I still agree with that. I’m happy that I had enough courage to put myself out and share myself with others because I know I’ve been able to inspire others to step outside of the box when it comes to their wardrobe choices no matter what their size. I discovered an amazing community on Instagram and made some friends through our mutual love of building fun outfits and all things J.Crew. But, beneath all of that, I wasn’t truly happy with myself and I wanted better for myself. I wasn’t healthy and that needed to change. My wardrobe became another excuse for not losing weight. What would I do with all of my clothes? I’d buy more things and any thoughts of trying to lose weight would be ignored. Hi! As promised, here is the second round of my try-ons at J.Crew from the June 2017 style guide rollout. First up, the One-Shoulder Ruffle Dress in Seersucker. I have no need for this dress, but I liked the fit and appreciate the knee length. This is part of J.Crew’s ready-to-party collection and also comes in papaya/white which looks like a peachy pink color. It also comes in petite and tall. This is lined and as you can see hit me at the knee. I am wearing a size 8 so I’d take the larger of your two sizes. This wouldn’t be office appropriate for me but some may be able to wear it to work. Different shoes/sandals would look better with this, in hindsight, these shoes weren’t the best pick. Hi! Another month, another round of new arrivals at J.Crew! I’m going to have to split this up in to two posts since I feel like I tried on everything in the store. My store was just upgraded to a new tier so it was more full than usual this month and I felt a little overwhelmed with my dressing room full of stuff. I went in the evening whereas I usually go first thing in the morning and I am on the tail end of my annual spring cold so I was probably a little more tired than usual but I pushed through. I got the style guide for June and I honestly didn’t see a ton that I had to have but once I tried a few things on I definitely have a few things I’ll be keeping an eye on and depending on your lifestyle, there are definitely items to love. I’m usually looking for workwear items and a few fun weekend pieces. The off-the-shoulder, ruffle, one shoulder trend is still strong and while I’ve more or less hit my saturation point with these, I caved and ended up with another ruffle in my closet for the summer. Enough of my rambling, onward to try ons! First up, the ruffles I had to have. The lightweight striped off-the-shoulder ruffle sweater. The minute I put this on I was sold. This sweater also comes in a solid version in black or dried thyme (read: olive) and is a viscose/poly blend. I tried a small which is my go to t-shirt size/Tippi size these days (I’m a 6 in blouses / 32E chest). What I liked about this vs. other off the shoulder tops is that it has a strong elastic and with the material of the sweater, it seemed like it would really stay off the shoulder without much adjustment. I did wear it around the house as I debated wearing it out last night (ended up being a little too cold) and it seemed to stay in place. I know it’s trendy, I know I probably won’t get more than two summers out of it, but it made me happy so it came home with me.